Sci-Fi writer Neal Stephenson has set up a new e-publishing venture to develop a new platform for creating and publishing digital novels. Stephenson, perhaps most famous for his post-Cyberpunk 1992 novel Snow Crash is launching a new publishing operation called Subutai, based out of Seattle and San Francisco. Subutai is developing what it calls the PULP platform for creating digital novels, offering authors the ability to augment their core text with images, video, music and background articles. PULP also features social networking aspects, so readers can earn badges for activity on the site, interact with other readers, create their own profiles and so on. Stephenson says of his latest venture: "I can remember reading Dune for the first time, and I started by reading the glossary. Any book that had that kind of extra stuff in it was always hugely fascinating to me." Subutai is launching its first serialised story called The Mongoliad about the Mongol invasion of Europe, this week. Readers pay $5.99 (£3.90) for a six-month subscription fee or $9.99 (£6.50) for a year. Subutai's co-founder and President Jeremy Bornstein hopes that readers will still be prepared to pay for content when "the experience is so much more rich, so much more involving." 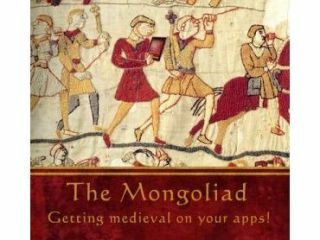 Head over to The Mongoliad website for more. An iPad/iPhone/iPod Touch app and and Android app are both in the works and set to arrive very soon.